Most of us would probably like to be lucky enough when playing online slots to be able to afford the sort of gems and precious stones on show in this release from Blueprint Gaming; it’s called Diamond Jackpots and it’s luxurious theme is complemented by a hefty progressive jackpot. 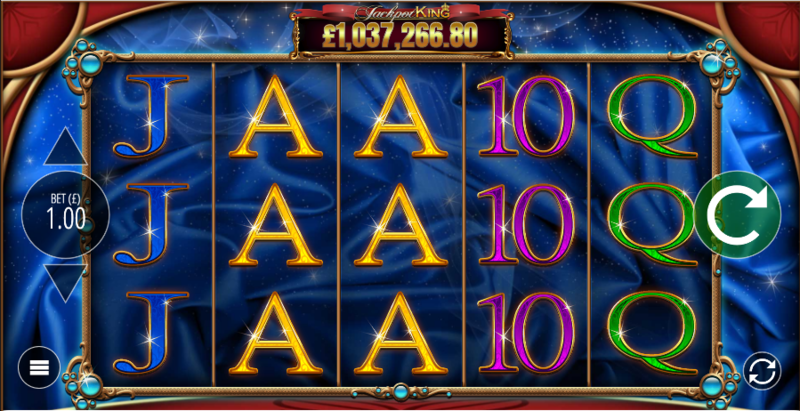 Diamond Jackpots is a five reel slot with three rows and twenty five fixed paylines; quality is the keyword here with bronze frames surrounding the reels accessorised with blue orbs in each corner. There’s a star-spangled backdrop and of course the progressive jackpot total displayed above the reels. There are four high value symbols including the huge diamond, a red ruby, some jade and what is possible a lump of quartz; 10, J, Q, K and A make up the lower values. 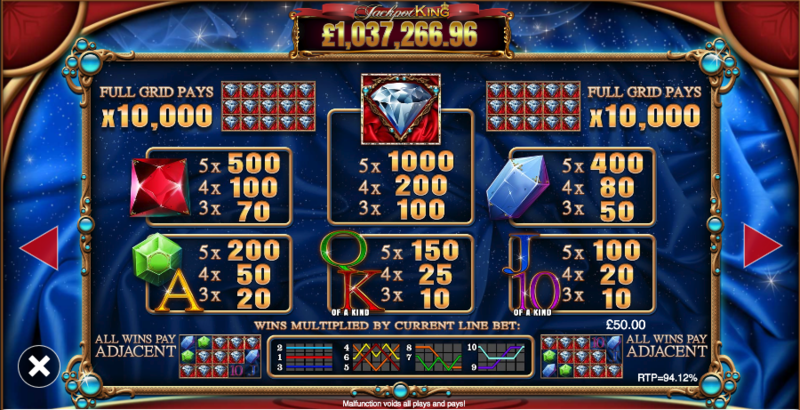 There are no wilds or other special symbols in Diamond Jackpots although it’s worth noting that landing a grid made up entirely of diamonds will pay out a massive 10000x your line bet. Although there are no free spins and suchlike, Diamond Jackpots is part of Blueprint Gaming’s Jackpot King progressive jackpot series and this feature is triggered by landing five jackpot symbols on the reels. You’ll then play a reel set where the aim is to collect crowns before the round ends – manage at least 15 and you’ll get to spin the wheel of fortune which could win you the progressive jackpot. Diamond Jackpots is quite a basic a slot but it’s designed to a very high quality with some huge gems on display; the gameplay is crisp and of course there’s a progressive jackpot to dream about. The RTP is 94.13%.